The Motorcycle Industry Accreditation Centre (MCIAC) is part of The Motorcycle Industry Association (MCIA) based in Coventry. The MCIA has looked after the interests of the motorcycle industry for over 100 years. Members are manufacturers and importers of powered two wheelers and suppliers of associated goods and services in the UK. MCIAC utilises the services of handpicked specialists to deliver, assess and quality assure their accreditation programmes and awards. They offer courses for both Approved Training Bodies and motorcycle rider training instructors. The Motorcycle Industry Accreditation Centre (MCIAC) has been an Institute of the Motor Industry (IMI) approved Accreditation Centre (since June 2013). The IMI visit MCIAC yearly to ensure that they meet the stringent standards set by the IMI, so you can be sure that their courses and quality assurance regimes are both relevant and robust. Why You Should Choose an MCIAC Gold Standard Accredited Training School. When you to take your Motorcycle training with an MCIAC accredited training school you can be confident that you will receive a standard of training and customer service that exceeds that required by DVSA only approved schools. Here at Streetbike our training school is both DVSA approved and MCIAC Gold Standard accredited! MCIAC accredited Authorised Training Bodies are audited every year by MCIAC Assessors who check 43 points within the Management, Quality, Safety and Training Delivery areas of each business. We are required by MCIAC to have in place a Customer Service Pledge, which sets out what you can expect from our training school. MCIAC Training schools are required to be able to offer you a choice of machine types when booking your CBT. At Streetbike we will always ask you if you want to book a “Geared” machine or an “Automatic” machine. We are required to put our customers at the centre of the learning experience and tailor the training to meet our customer’s needs, goals and objectives. Streetbike Motorcycle Training will always meet the Mandatory Requirements for Authorised Training Bodies required by DVSA and MCIAC you will never receive a shortened CBT road ride from Streetbike! 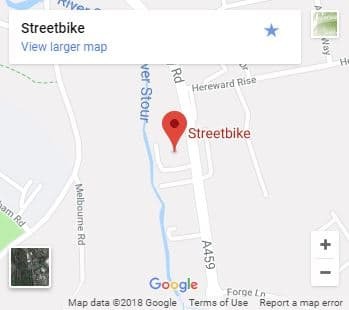 Streetbike will submit your contact details to MCIAC in order that they can contact you with a feedback survey following your training with us. Streetbike have undertaken the highest level of the Approved Training Body accreditation programme, to demonstrate our professionalism, and our aspiration to be amongst the best in the industry. MCIAC are backed by Carole Nash, one of the largest motorcycle insurance companies in the UK. Carole Nash believe (like us) that you will receive outstanding training, and have guaranteed our customers a reduced insurance quote on successful completion of their training. “Translation” completing your motorcycle training with Streetbike, as an MCIAC accredited training school should save you money on your insurance. At Streetbike, you are supported by two of the best-known brands and manufacturers of motorcycles in the UK, Suzuki and Yamaha. MCIAC accredited Authorised Training Bodies are recognised by the Driving and Vehicles Standards Agency (DVSA) as providing higher levels of training. Streetbike are members of the Motorcycle Industry Trainers Association (a member only organisation for trainers who strive to deliver excellence in training). We at Streetbike have gone the extra mile in gaining our accreditation from the MCIAC and are proud to have achieved the “Gold” Standard of Accreditation. So, what does that mean to our customers? All MCIAC accredited Authorised Training Bodies are of the highest standard in the country and are constantly monitored for their levels of training and service. Training classrooms which are well furnished and utilise technology, toilet facilities are within the building and have separate facilities for male and female use. Protective equipment supplied is clean and serviceable with a large range of sizes for male and female use provided. High levels of fully DVSA qualified Instructors. (The allowed ratio is 10 part qualified instructors to 1 fully qualified Instructor. MCIAC Gold requires no more than 1:1).